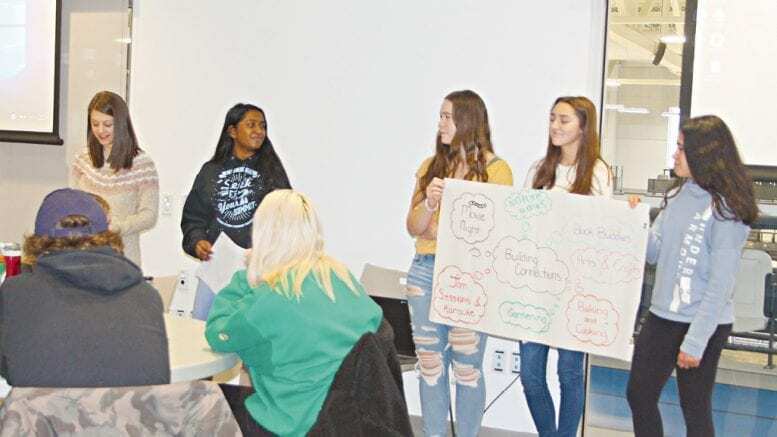 In mid-December, 29 Grade 11 and 12 students from E. L. Crossley participated in a collaboration meeting to plan future programming sessions involving seniors and youth integration at the community centre. Titled the Innovation Creativity and Entrepreneurship (ICE) Challenge, the planning session was part of students’ Specialist High Skills Major (SHSM) curriculum requirements. The purpose of the challenge was for students to engage with a community partner, in this case the community centre, and implement a strategy the community partner needed to solve a problem. In this case, the challenge was how to use down times in the facility. In addition, the students were presented with the challenge of how to integrate programs involving youth and seniors during the centre’s down periods. Janet Cripps is the lead teacher for the health and wellness-related programs, while Heather David is the lead teacher for business-related programs. At the planning session, the students were divided into groups, presented with themes and different presentation styles. After the brainstorming sessions, the students presented their ideas to the other groups. Students presented a variety of ideas including garage sale and “stuff swap,” family-friendly movie events, cooking and culinary sessions, creative proposals that included jam sessions, dancing lessons and poetry slams, even ways on how to have seniors and youth engage openly about mental health. They also established plans on how the potential initiatives would be advertised. “Each group’s cluster of ideas were unique,” Cripps said. Cripps said that the program is offered through the Student Success Initiative, that expands Secondary School programs to help meet students’ individual learning styles and interests. These programs allow students to customize their high school experience through a variety of new and enhanced learning options, including Dual Credits, Specialist High Skills Majors and Co-operative Education. These programs help to meet the needs, interests and strengths of all students, engaging them in learning and better preparing them for graduation and beyond, said Cripps. “This program allows students to customize their secondary school education to suit their interests and talents while developing the specialized knowledge and skills to further them along their future path,” she said. Cripps said not only does the program allow “bundling” of specific courses towards a student’s future career path, the co-ops also give them “real- world industry experience” to educate them as to what to expect. Certain programs and opportunities with the SHSM unique to the student are also available at no cost, including CPR and First Aid and Reach Ahead Experiences, where students attend Brock University for a day to learn about post-secondary programs and participate in university lectures. Cripps added that as an incentive, colleges and universities are often offering scholarships those who graduate with a SHSM seal. Brock University provides $500, while Niagara College provides $1,000 to students enrolled in a program related to their SHSM and earns an average of over 80 percent in the required courses. For a student’s post-secondary aspirations, Cripps said now not only are marks important in the application process, but also equally important are the actual experience and knowledge students have acquired from their co-ops.